Working in pastel and oil, Elizabeth Washington was a renowned painter of portraits and landscapes. Born in 1871, in Siegfried's Bridge, Pennsylvania, Washington was the great-grandniece of the first President of the United States. As such, she was a member of the Colonial Dames of America and the Magna Carta Dames, but her true devotion was to art. Washington studied at the Philadelphia Museum School of Industrial Art (now the Philadelphia College of Art) and at the Pennsylvania Academy of the Fine Arts under Hugh Breckenridge and Fred Wagner. She exhibited at the Academy throughout her lifetime; there she was awarded the Toppan Prize (1913); the Cresson Traveling Fellowship (1912); and the Mary L. Smith Prize (1917, 1934). Washington also exhibited widely across the country including what is now the Springfield Museum, Utah (1927); the Corcoran Gallery (1916, 1923); the Carnegie Institute (1920-1922); the City Art Museum of St. Louis; the National Academy of Design (1930); the Woodmere Art Museum (1941-1945); the Philadelphia Art Alliance; and the Philadelphia Museum of Art. 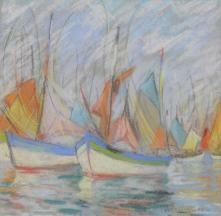 In 1949, Newman Galleries of Philadelphia held a retrospective of her work. She was a member of the Philadelphia Art Alliance, North Shore Art Association, Pennsylvania Society of Miniature Painters, the Plastic Club, and the Fellowship of the Pennsylvania Academy of the Fine Arts. Elizabeth Washington was nationally known for her miniatures and portraits, but it is her landscapes that most clearly express her delight in the world around her. Each work of art is a masterpiece of color, design, and mood, reflecting her deep commitment to her chosen field. She died in 1953 at the age of 81, leaving a rich artistic legacy.